Osvaldo Reyes, was considered an exponent of the social realism, sometimes getting closer to surrealism and symbolic realism. He forms part of the generation of the 40’s and has been strongly influenced by Mexican and French painting. A well-known Chilean arts critic, theteacher Víctor Carvacho, defined him as “a genuinely Chilean artist, and an academician who, like others, has known how to break from the rules of academy”. 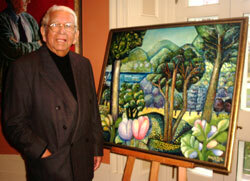 Born in Santiago in 1919, Reyes is son of a railway worker and a mother who worked as a retail seller. The early death of his father forced him to work from the early age of 10 years old to help support his mother and seven brothers, while at the same time going on with his studies. In the primary school he stood out for his talent to draw. This talent was further developed in the Normal School and flourished in the School of Fine Arts. of Mexico, created by Diego Rivera, and was invited by the Nobel Prize Winner for Literature, Gabriela Mistral, to live for a period in her residence in Veracruz and work as an advisor. Mistral’s poetry had a great influence on Osvaldo Reyes artistic development. On his return to Chile, he began teaching and continued with his work as a muralist. Two award winning Chilean artists, Anita Cortés and Laureano Guevara, were important influences on Osvaldo’s development, as well as Armando Lira, Oscar Gacitúa, Armando Sanchez and Augusto Eguiluz. of Chile and Mexico, with the flowers that Reyes takes to Toronto. The colours of Mexico stand out in his palette, a palette that Reyes employs in a meticulous and methodical way, fusing the colours into his own personal rainbow, which can be seen as a series of flowers, some of which will be in the exhibition at the Museum. He uses colour to give light and shade, creating a special aura in his oils. that “Osvaldo Reyes has a style in the expressionism, marked by symbolic Latin American features”. She says that Reyes produces works that represent a “spiritual contrast between the reality and the fantasy in his creative process, generating what we observe in his work: a synthesis between these twopoles”.